The Ryukyu government began instituting measures to reconstruct their society beginning in the mid 1600’s, following the Satsuma invasion. These efforts continued for the rest of that century. Three notable leaders emerged, who would shape the philosophical and political course of the Ryukyu kingdom. All three faced the problem of how to justify the existence of Ryukyu in light of the new conditions the kingdom found itself in, namely a vassal to both China and Japan. Each of these men had distinctly different philosophies on how best to accomplish this. In this post, we will examine the works of perhaps the most famous of the three, Sai On. Finally, the last and perhaps most influential figure to steer Ryukyu’s direction was Sai On (Gushi-chan Bunjaku). Sai On was pro-Chinese like Tei Junsoku, but also pragmatic. He was appointed to the Sanshikan in 1728, and retired in 1752. Sai On used the tension created between the two prior views – pro Japan vs. pro China - to produce a new vision, and based it on Confucianism. He sought to place Ryukyu on a moral equivalent with both China and Japan. He believed and preached that outward material stability and prosperity were the result of inward moral excellence. He therefore took the position that Okinawa’s destiny was in its own hands. He understood the dominating forces at play from Satsuma, yet also recognized the continuing need to maintain contact with China. His strategy was to use Confucian ideology to minimize the impact of Satsuma political power while at the same time empowering Ryukyuans to take their fate into their own hands. He returned to Okinawa three years later in 1711 and became tutor to crown prince Sho Kei. The following year he conducted a geomantic assessment of Shuri castle and other sites. That same year Sho Kei became king. Sho Kei’s investiture, however, essentially depleted the treasury, and an ad hoc tax was placed on Shuri, Tomari, Naha and Kumemurea which lasted until 1728. Sai On was very much involved in affairs of the country. In 1718 he dredged Naha harbor, which had filled with silt. In 1719 Sai On moderated a tense situation known as Hangaa in Okinawan, or Hyoka in Japanese, or the “Valuation Incident”. A Chinese mission had arrived with goods that it expected to sell, valued at 2,000 kanme of silver, but Ryukyu had only 500 kanme. The Chinese traders were quite upset, but Sai On was somehow able to calm the situation. Nevertheless, the 1700’s was a time when a wide variety of culture flourished: literature, music, drama, fine arts, and technical studies. It was during this era that turtle-shell tombs were introduced. The formation of formal lineage organizations also began. Sai On was prolific when it came to writing his views on a variety of issues. His “The Way of Government” was a description of how he viewed the proper conduct for a country in order for it to prosper. Sai On also espoused his views on countries and why some were great and some were not. Based on a country’s total resources one could separate countries into superior, median and inferior levels. Each of these divisions could be further separated into high, middle and low based on how those resources were used or spent. The basic resources were water, fire, earth, wood, and metal. To be prosperous, a nation required all five elements. Therefore, according to Sai On, Ryukyu was a Low-Inferior country. It did not have many resources to begin with, and what it did have was used heavily. Water, fire, and earth are ubiquitous to all countries, therefore not the deciding difference. Wood and metal are the key elements to address in order to build up a country’s greatness. The Ryukyu Kingdom lacked metal but was rich in wood. Therefore, by exporting wood to Satsuma and importing metal from them in return, the Satsuma overlords allowed Ryukyu to have all five elements and to be complete. Sai On felt that symbols were important items to be manipulated in order to create and maintain political authority. He therefore sought to control and change the relationship between the Ryukyu King, the High Priestess, and God. In the old order of authority the High priestess communicated directly with heaven, and heaven spoke directly to her. The King was considered to be a God. Sai On’s new position was that the King, not the High Priestess, was the link to heaven and furthermore, the King was a Confucian sage. Therefore the King had a primary and active role and the High Priestess held a secondary role. In this way he tried to reduce the influence of women in court and government affairs. Forest and agricultural policies were very much on Sai On’s mind because by 1735 timber resources were being severely depleted in Okinawa. Sai On became deeply interested in the scientific and technical investigation of cultivating crops, forest management, and hydraulic engineering. He wrote handbooks on agricultural policies, and made implementation of these policies a part of each peasant’s duties. Penalties were assessed for anyone found cutting trees without permission. On the other hand, he allowed the local peasants to share in the profit from government forest lands in exchange for their participation in his new policies. In terms of agricultural engineering, he developed the “fish-scale” pattern of forest construction to gain more value from the lumber activities. This method allowed more trees to grow straight and tall and therefore more valuable, since trees that were bent and gnarled by the wind were of lesser quality. Old bent trees were cut down in many small semicircular blocks. A thin ring of old growth was left in place, forming an interconnected network of semicircular old growth shells, in a honeycomb network. This protected the young trees from the wind, allowing them to grow tall and straight. He also used Ryukyu pines (called “Sai On” pines) as windbreakers, especially on roads. A thick sturdy shrub called adan was planted in between the spaces between trees, and together this made a natural wall that was thick and tall. This method was also used to protect field and crops from wind and waves. It was used along rivers and ditches too. Sai On viewed local Okinawan practices as being not only in conflict with Confucian morality, but also a drain on the kingdom’s wealth due to high costs of festivals, plus the time lost to agriculture productivity. As one example, mourning rites traditionally lasted 49 days. Since it was typically the case that everyone in an entire village was related, this meant that no one in the village worked in the fields for that entire time. Therefore he attempted to place restrictions on local festivals and religious practices to try to increase the number of days per year that peasants spent working, as opposed to partying. Sai On also orchestrated a campaign against shamanism, but was not successful. And Confucianism never caught on with the villagers. While Sai On had the support of both the King and leaders in Satsuma Japan, nevertheless he had opposition from others. Resistance to Sai On came from three sources. Peasants did not like his attempts to change their religion and culture, and therefore gave passive resistance when they could. The Elite of Kumemura felt themselves in a rivalry with Shuri royalty for influence, and for control of Confucian schools and teachers. Tei Junsoku and his followers had strong differences of opinion with Sai On’s views on Japan’s role in Ryukyu’s wealth and future. In 1734 a rival faction rose up against Sai On, accusing him of being too pro-Chinese, and led by a pair of scholar-bureaucrats, Heshikiya Chōbin and Tomoyose Anjō. Before any plots against Sai On could be executed, however, Chōbin and fourteen others were arrested and put to death. Legend says that Heshikiya Chobin and the daughter of Shō Kei had been in love, and that when he was executed, she threw herself from the castle walls, committing suicide. Only her leg was found, and from then on a particular pavilion in the castle's gardens came to be known as "One-Leg Pavilion" (Kunra gushiku). Satsuma’s control of Okinawa has been beneficial to Ryukyu. The Okinawa mountain ranges all connect to form a shape like a dragon. Dragons are associated with concentrations of material energies. This geographical arrangement and concentration of energies helped Ryukyu in the past despite the lack of the “Way of Government”. Satsuma had brought to Ryukyu the “Way of Government”. The first Okinawan to write an autobiography, he died in 1761. His policies, however, continued to be embraced by all subsequent Ryukyu Kings up until the Meiji Restoration and subsequent dissolving of the Ryukyu Kingdom. Gregory Smits. Visions of Ryukyu: Identity and Ideology in Early-Modern Thought and Politics. University of Hawaii Press, 1999. George H. Kerr. Okinawa: the History of an Island People, revised edition. Tokyo: Tuttle, 2000. Each of these men had distinctly different philosophies on how best to accomplish this. In this post, we will examine the works of Tei Junsoku. Tei Junsoku (Nago Ueekata Chobun), often called the “Sage of Nago”, was the second person of historical note to influence Ryukyu development following the Satsuma invasion of 1609. Born in Kumemura in 1663, and a frequent traveler to China, he served various positions in the Ryukyu government, including membership in the Sanshikan (Council of Three). Contrary to Sho Shoken’s approach, Tei Junsoku viewed Ryukyu as a vassal of China’s Qing Court, and before that, the Ming Dynasty. He worked to improve Ryukyu’s image in China’s eyes by promoting Chinese studies in Ryukyu, and essentially ignored any impact or influence on the kingdom that may have come from Japan. Tei Junsoku was a scholar, poet, and diplomat who promoted Chinese studies in Ryukyu. He had very little political influence, although he was a district administrator of Nago for a time. He spoke Chinese fluently and spent many years in China over the course of five visits. Tei Junsoku viewed Beijing as the cultural center of the world and tried to tie all things Ryukyuan to China, rather than Japan. Tei Junsoku received his formal education in Kumemura in Okinawa, and at age 21 moved to China to study for four years. When he returned to Kumemura in 1687 he got a job as a teacher. Two years later he went back to China as an official at the Ryukyu trading center in Fuzhou. When he returned to Ryukyu three years later, and brought with him several sets of Chinese historical works in 159 volumes, printed at his own expense. Two years after that in 1693, at age 31, he won a poetry competition sponsored by the crown prince Sho Jun. In 1695 he went back to china as interpreter for a tribute mission, travelling all the way to Beijing. Along the journey he wrote poetry on the trip, a famous work called “Setsudo’s Travels to Beijing”. In 1704 he became tutor to crown prince Sho Jun, who died before taking the throne, and then to Prince Sho Eki who later became king. In 1706 he went back to China as head of a tribute mission. While there he published two books at his expense before leaving. “Amplification of the Six Maxims” was a rewriting in colloquial Chinese language of the Confucian maxims that originated in Ming China in 1652. He also wrote a Ryukyu edition. The book was used to teach proper Chinese to Ryukyu students. In 1754 on a trip to Edo (Tokyo) as the official in charge of correspondence he gave a copy to shogun Tokugawa as a gift from Satsuma. The shogun was so impressed that he ordered it translated into Japanese. It was published under the title “The General Meaning of the Amplification of the Six Maxims”. It was used widely in elementary schools in Japan well into Meiji era. His other book, “Guide to Navigation” was a detailed manual for how to navigate between Fuzhou and Naha, based on two sources: Folklore, and his own studies under a Chinese ship pilot. The work was significant in that it contained ocean maps, instructions for how to navigate by celestial bodies, methods of weather interpretation, the invoking of divine powers for guidance, and perhaps most importantly - compass techniques. In 1718 he revised the rites at Confucian temples in Okinawa to be more like the rites as practiced in China. His final trip to China was in 1720, at age 58. He brought back several dozens of volumes of Chinese poetry again at his own expense. Tei Junsuko’s final years were spent in despair and semi isolation after losing all his sons to illness or accident. After his death he was considered a symbol of selfless virtue and high morals. He died in 1734. Each of these men had distinctly different philosophies on how best to accomplish this. In this post, we will take a brief look at Sho Shoken. The first to lead reforms was Sho Shoken (Haneji Oji Choshu). Born in 1617, he served as Sessei (Prime Minister) from 1666 to 1673. He saw Ryukyu as a vassal of Satsuma first and foremost. He worked to improve the image of Ryukyu and the Okinawan people in the eyes of Satsuma Japan. Sho Shoken led efforts to make it seem that this had been the case since ancient times. He died in 1675, two years after retiring as Sessei. Sho Shoken studied Confucianism, and traveled to Satsuma 3-4 times in his lifetime, spending a total of four years in Japan. He looked to Satsuma as a model for how Ryukyu should conduct itself. In 1666 he became a sessei (prime minister) with the strong backing of Satsuma. Sho Shoken therefore urged Ryukyuans to master Japanese culture, embrace Satsuma control, and cooperate with their overlords, in order to revitalize the society, economy, and government of Okinawa. In 1650 he began work on the famous “Mirror of Chuzan”, a recorded history of the Ryukyu Islands from the earliest days. Much of our knowledge of the old kingdoms comes from this work. But it needs to be interpreted in the spirit of the times in which it was written, namely that the stories were “spun” to fit with the idea that Ryukyu had always been a part of Satsuma territory. It also emphasized Confucian ethics. Sho Shoken also attempted to institute various reforms to change customs and attitudes that were not only in line with Japanese ways, but also to reduce household expenses, reduce corruption, and increase diligence among government officials. In the traditional Ryukyu religion, women were considered to have superior spiritual powers compared to men. Sho Shoken tried to change this. He attempted to remove female religious officials from the public realm as much as possible. As just one example, the royal palace was no longer allowed to use female palace officials to convey royal messages. He also tried to regulate spending on weddings, funerals, and ancestral rites among the aristocracy since paying for these costs was the main reason why local peasants were abused. Sho Shoken retired as Sessei in 1673, and passed away in 1675. After the 1609 invasion of Okinawa by the Satsuma clan of Japan, morale in Ryukyu was devastated. JanaUeekata (Oyakata) had been beheaded by Satsuma’s samurai for not acquiescing to the terms of the peace agreement that was offered to King Sho Nei, and this act sent a powerful reminder to the Okinawans of the true relationship between Ryukyu and Japan. Open resistance or defiance of Satsuma authority would no longer be tolerated. Ryukyu officials, accustomed to their own ways, now had trouble adjusting to the new Japanese influence and what it meant in terms of their powers and authority. For several decades, extreme poverty and lack of leadership existed in Ryukyu at all levels. Ryukyu government controls were weak, and local officials exploited the situation to their own advantage, spending money on prostitution, extravagant weddings, and costly funeral ceremonies. To pay for these luxuries, they placed excessive demands on the labor services of the peasants under their authority who supported them. Officials would often force peasants to take high interest loans to survive and support their families. Then, when the peasants could not pay off their debt, the officials demanded labor as repayment instead. Some rural families were even forced to sell family members into indentured servitude to pay expenses. Such corrupt practices hurt farm productivity significantly, and peasants began leaving the countryside in greater numbers to move to Naha or Shuri, where they could hope to escape these hard conditions. Finally, beginning in the 1650's, the Ryukyu government began instituting measures to reconstruct their society. These efforts continued for the rest of that century. Each of these men had distinctly different philosophies on how best to accomplish this. The first person of note to lead reforms was Sho Shoken (Haneji Oji Choshu). Born in 1617, he served as Sessei (Prime Minister) from 1666 to 1673. He saw Ryukyu first and foremost as a vassal of Satsuma. He worked to improve the image of Ryukyu and the Okinawan people in the eyes of Japan. Sho Shoken also led efforts to make it seem that Japan had been a strong connection since ancient times. He died in 1675, two years after retiring as Sessei. The second person of note to influence Ryukyu development was Tei Junsoku (Nago Ueekata Chobun), often called the “Sage of Nago”. Born in Kumemura in 1663, and a frequent traveler to China, he served various positions, including membership in the Sanshikan (Council of Three). Contrary to Sho Shoken's approach, Tei Junsoku viewed Ryukyu primarily as a vassal of China’s Qing Court, and before that, the Ming Dynasty. He worked to improve Ryukyu’s image in China’s eyes, by promoting Chinese studies in Ryukyu, and essentially ignored or minimized the significance of any impact or influence on the kingdom that may have come from Japan. He died in 1734. Finally, the last and perhaps most influential figure to steer Ryukyu’s direction was Sai On (Gushi-chan Bunjaku). Sai On was also pro-Chinese like Tei Junsoku, but also pragmatic. He was appointed to the Sanshikan in 1728, and retired in 1752. Sai On used the tension created between the two prior views – pro Japan vs. pro China - to produce a new vision, and based it on Confucianism. He understood the dominating forces at play from Satsuma, yet also recognized the continuing need to maintain contact with China. His strategy was to use Confucian ideology to minimize the impact of Satsuma political power while at the same time empowering Ryukyuans to take their fate into their own hands. He placed Ryukyu on a moral par with both China and Japan. He believed and preached that outward material stability and prosperity were the result of inward moral excellence. He therefore took the position that Okinawa’s destiny was in its own hands. The first Okinawan to write an autobiography, he died in 1761. A series of posts will follow this one, giving some additional details about the work of each of these three historical figures in Okinawan history. Where is King Gihon Buried? My thanks go to a reader from Brazil who got me started on the search for a definitive answer to the question: what happened to King Gihon and where is his final resting place? "Finally, despondent over what had befallen the kingdom, he abdicated and went into self-imposed exile in the wilderness. It is said that he vanished somewhere in the hills at the remote northern tip of the island at Heda-misaki." My only reference at that time was a brief passage from page 51 of George Kerr’s book. while staying in Kitanakagusuku, he saw a place called Nasu no Utaki, which claims that three kings are buried there: Gihon, Shunba-Junki, and Shunten. So, armed with this intriguing set of clues, I set out on an internet search to see if I could dig up any more information about this mystery of King Gihon's tomb. ". . . Gihon abdicated and 'withdrew into the forest alone.' The time and place of his death are unknown, although tradition says that he vanished somewhere in the hills at the most remote northern tip of the island, Heda-misaki." I then found this website which has a post on entitled “The Tomb of King Gihon”. 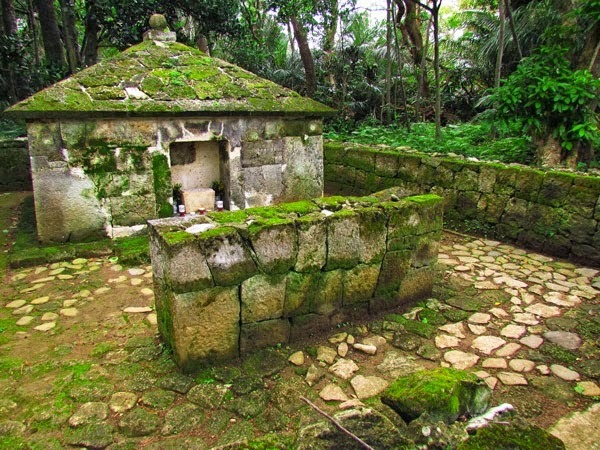 In the article the author reports that the King is believed to have fled to a place called Asumi near Cape Hedo, and is buried in a tomb in the town of Hedo. This agrees with George Kerr’s hypothesis. The Sho royal family is said to have travelled to this tomb in the late 1800’s to restore the burial site, thus perhaps starting this belief. The author does add a caveat that the data on Hedo is not conclusive, and that others claim the burial site is in Kitanakagusuku. Wikipedia is silent on the burial place for King Gihon, but does claim that King Shunten is buried at Urasoe yodore, not Kitanakagusuku, and enshrined at Naminoue Shrine along with three other Kings. Is this another mystery around King Shunten's tomb? Searching further, the only information I could find on Urasoe yodore says that King Sho Nei is buried there, along with “three other rulers of the Ryukyu islands”. Another site mentions King Sho Nei and King Eiso as being buried at Urasoe yodore. I was not able to find any other mention of King Shunten being buried there. 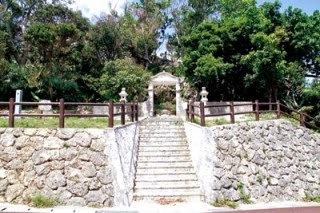 Regarding the Naminoue Shrine, Wikipedia claims that this shrine has a long history and in 1924 was designated as the official center of religious affairs on the island. It also states that Kings Shunten, Sho En, Sho Nei, and Sho Tai are enshrined there (not buried). Finally I discovered this website talking about Kitanakagusuku. There it states that King Gihon, along with King Shunten and King Shunba Junki, are entombed at the Nasu no Utaki Shrine. At last, I found a site that provides a positive assertion about King Gihon’s resting place being in Kitanakagusuku, and supports the information that my reader provided, handed down to him from generations of his family members! So - Where is King Gihon Really Buried? Based on the limited information I have been able to gather from searching English-only internet sites, but also inspired by my reader’s family story, I am inclined to favor the Kitanakagusuku location as the burial site for King Gihon, not Hedo. But in the meantime, I am now wondering . . . where is King Shunten really buried? If anyone has further information on either of these topics, please share! In the Ryukyu kingdom, one’s genealogical record was an important status symbol. Genealogy determined social status and the types of work one could get in the government. It was so important that in 1690 a genealogical bureau called Chizuza (Keizuza in Japanese) was formed. All aristocrats were ordered by the government to submit their records showing their lineage from the old territorial leaders. The government considered there to be two types of people: those who had genealogy (aristocracy) and those who did not (commoners). This bureau’s job was to keep track of those with genealogy and to control official records of genuine genealogy. Originally, the aristocracy were called samure, or samurai. After 1609 a more common phrase used was chimuchi or “possessors of genealogy”. Common people were termed muchii or those people “without genealogies”. Throughout the Satsuma period of Ryukyu, about one third of the population was royalty, and living in the tax free urban areas. That made a 2-to-1 ratio of peasants to royalty. The peasants had to work and pay taxes to support the royal families who did not pay any taxes. In Ryukyu, attainment of genealogy by a commoner was a means to social status, and was highly sought after. The benefits of having a genealogy were many, including prestige and influence, ability to obtain a government job with a stipend, and freedom from working on farmlands and producing tax grains. The government, however, did not want too many commoners to be converted to aristocrats since this would reduce the labor force needed for production of goods to support the noble families. Genealogy was sought by both legal and illegal pathways. Legal ways to obtain a genealogy normally involved the performance of "meritorious service" for the kingdom. However, a person could also contribute monetary donations for “public purposes.” In other words, you could legally buy a genealogy for the right price. Illegal methods to become a person of genealogy involved commoners conspiring with corrupt officials to have forged genealogies created. Aristocrats also would try to bribe officials to create “improved” genealogies. Commoners who were granted genealogies were known as shinzan or “newly entered (into aristocracy)”. They were distinguished from fudai or “hereditary” aristocrats. Therefore even with an aristocratic title and the same rank, there were two different classes of aristocracy, with “new aristocrats” inferior to “hereditary aristocrats”. The name Sho was for exclusive use of the royal family, having been given to Ryukyu by the Ming dynasty in 1372 when Satto was recognized as King of Chuzan. No one but the king could use that name or character. Those in the Sho lineage would designate their royal status by having a “cho” in their name, Examples from Matsuda's book: Higa Shuncho, Kabira Chosei, etc. Having a fiefdom, or assigned territory, entitled the fief holder to usually about one third of that land’s yield. It also gave him administrative rights, and the labor of a limited number of peasants under his control. It also gave him the right to use the name of the village or district as his surname. Fief holders were also entitled to a government salary if employed by the government. Woji were the sons of the kings of the old territories, as well as aji who were promoted in rank. Aji were the eldest sons of men with the title woji. It was a hereditary position. The woji and aji were men of exceptional status. This was the highest social level below the King’s family, and distinct from other levels. Woji and aji were entitled to one majiri, or district, of land. Wekata or Oyakata ranks were obtained through meritorious service, or given to the younger sons of aji and wekata. These positions were a step below aji. People of this rank also held one majiri of land. Pechin were the “gentry” class. A pechin held one mura, or village, within a majiri. This was the lowest rank of fief holder. Fief holders had to live in one of the four urban districts, not in their own lands. Actual local control of the district or village was handled directly by the Shuri government. Satonushi included family members of fief holders and commoners who had demonstrated meritorious service. This was the rank of soldiers, scholars, priests, and clerical workers. Members of this class could rise via meritorious service to the status of pechin – which would then give them grants of small fiefs (a village or mura), or the higher status of wekata which would entitle them to grants of large districts (majiri). Chikudun class included those hereditary aristocrats who were not entitled to any grants of fiefs. It also included the “new” aristocracy. Heimin were those “without a genealogy”. They were the people who provided the labor to support the noble families and pay taxes. This group was about two thirds of the kingdom’s population, and included farmers, fishermen, and laborers, as well as drifters, pig butchers, beggars, and prostitutes. The Shuri government provided certain privileges to aristocrats, including land and stipends depending on one’s social rank. In the early 1500’s King Sho Shin had started a ranking system for the nobility. He stipulated different headdresses and hairpins be worn by different social levels. This was basis of the formalized system put into place after 1609. It was a nine-grade system, copied after the Chinese. Each grade was divided into upper (a) and lower (b) classes. Generally, the level one served in government depended on one’s social level. The Sessei or Chief Councillor was ranked in the woji/aji class, meaning that he also came from these classes. The Three Councillors, or Sanshikan, were ranked as wekata, again meaning that they came from these levels of society. This was generally true for all levels of government. Wekata and pechin held the important positions in almost every agency, grades 2a-6b. The lower levels, grades 7a-9b, included clerical and secretarial workers. They were typically younger members of fief-holding families, or members of non-fief holding families, both young and old. The lowest levels in government, those with no rank, included pages, and manual laborer. These jobs were filled by urban commoners, and people from aristocratic families who were not yet old enough to be given the lowest rank of 9b or 8b. In all, there were about 1,400 officials plus another 260 non-bureaucrat fief holders who received stipends totaling about 25% of the kingdom’s general expenditures. Promotion in rank occurred based on a person’s age, then followed by any recognition for meritorious services, character, work experience, and exemplary conduct. The higher one’s social status and age, the higher ranks one could reach and the faster one could move up the ladder. Older men were ranked higher than younger men. Lower ranks took civil service exams. Those persons of hereditary aristocracy moved up more quickly than those who were “new” aristocracy. Mitsugu Matsuda, “The Government of the Kingdom of Ryukyu, 1609-1872”. Gushikawa City, Okinawa, Japan: Yui Publishing Co., 2001. George H. Kerr, "Okinawa: the History of an Island People, revised edition". Tokyo: Tuttle, 2000.